We have developed a novel ex vivo model to study hormone action in the human breast. It is based on tissue microstructures isolated from surgical breast tissue specimens which preserve tissue architecture, intercellular interactions, and paracrine signaling. Sflomos, G., Shamseddin, M., Brisken, C. An Ex vivo Model to Study Hormone Action in the Human Breast. J. Vis. Exp. (95), e52436, doi:10.3791/52436 (2015). The study of hormone action in the human breast has been hampered by lack of adequate model systems. Upon in vitro culture, primary mammary epithelial cells tend to lose hormone receptor expression. Widely used hormone receptor positive breast cancer cell lines are of limited relevance to the in vivo situation. Here, we describe an ex vivo model to study hormone action in the human breast. Fresh human breast tissue specimens from surgical discard material such as reduction mammoplasties or mammectomies are mechanically and enzymatically digested to obtain tissue fragments containing ducts and lobules and multiple stromal cell types. These tissue microstructures kept in basal medium without growth factors preserve their intercellular contacts, the tissue architecture, and remain hormone responsive for several days. They are readily processed for RNA and protein extraction, histological analysis or stored in freezing medium. Fluorescence activated cell sorting (FACS) can be used to enrich for specific cell populations. This protocol provides a straightforward, standard approach for translational studies with highly complex, varied human specimens. Information about the mutational landscape in breast cancer is increasing at rapid pace. Less attention has been paid to systemic factors that influence breast cancer development. Exposure to reproductive hormones has a major impact on disease progression1-3. Yet, the mechanisms by which reproductive hormones impinge on the human breast are poorly understood. Work with genetically engineered mouse models has revealed that they involve cell intrinsic and paracrine signaling through several downstream effectors4. The limited knowledge about hormone action in the human breast is largely attributable to a lack of adequate models. Most work on the mechanisms of estrogen receptor (ER) and progesterone receptor (PR) signaling has been performed with hormone receptor positive breast cancer cell lines, such as MCF-7 and T47D. These were derived from pleural effusions from patients with advanced breast cancer who had already received multiple treatments5. The biological relevance of findings in such simple in vitro models of the human breast is questionable and target genes identified in these in vitro models are differ from target genes that are identified in animal models6. When primary human breast epithelial cells are cultured in vitro they tend to lose hormone receptor expression and hence hormone response7,8. This problem can be circumventd by sophisticated 3D approaches using matrigel. In this way, C. Clarke and colleagues succeeded in establishing breast epithelial cells that maintained hormone receptor expression and showed a proliferative response to progesterone stimulation9. Yet, two important in vivo progesterone receptor target genes, Wnt-4 and RANKL, were not induced upon progesterone stimulation in this system9. This approach was recently taken on further with in vitro hormone pretreatment and RANKL induction was achieved10. A caveat remains that matrigel has activities that are batch-dependent, is expensive, and demands an experimental design that is apt for small cell numbers only. Based on the finding that in vivo ER and PR signaling are largely mediated by paracrine interactions11, we argued that intercellular interactions need to be maintained. Another important factor that is lost as tissues are dissociated to single cells for in vitro culture are the interactions of the epithelial cells with the extracellular matrix; yet these are critical for epithelial differentiation and their disruption is important in tumorigenesis12. With this in mind, we established a method to isolate breast tissue microstructures from fresh surgical discard material13. 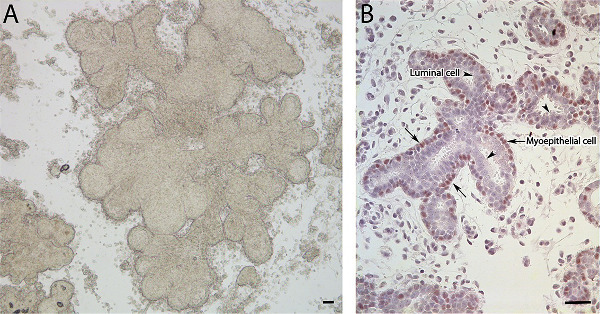 The breast parenchyma, consisting of a two-layered epithelium with inner luminal and outer myoepithelial cells, is dissected away from adipose tissue and subjected to mechanical and enzymatic dissociation. After washing and centrifugation, fragments of milk ducts are obtained that retain close interactions with many stromal cells. These tissue microstructures remain hormone responsive. The model was validated in clinical specimens13. As such, the present procedure can help to study hormone action in the breast in a biologically and clinically relevant context. General considerations: Ahead of time, set up an ethics protocol, prepare questionnaires for patients, and see to training the clinical personnel. Before using material from reduction mammoplasty surgery, procure authorizations, and ensure patient consent. Tissue may be infectious and needs to be handled accordingly. This protocol was approved by the ethical committee of ISREC - Swiss Institute for Experimental Cancer Research. To ensure optimal sample quality for bio-banking, a number of steps are carried out at the hospital prior to transport to the laboratory. Obtain human breast tissues under sterile conditions from reduction mammoplasty surgery and blood samples, if required. Tissue needs to be examined by pathologist who will sample to exclude presence of malignant lesions. Place the breast tissue under the hood on a sterile board and prepare scissors, surgical scalpel and forceps which are already sterilized with steam sterilizer. Make deep cut at different sites of the mammary tissue using a scalpel to open it. In human breast tissue look for white strands consisting of ducts and lobules, which are embedded in yellow adipose tissue. NOTE: The ratio of the white parenchymal to the yellow adipose tissue differs among women; typically younger women have more epithelial tissue. Pick pieces of white material and hold them with forceps, then separate them gently from the adipose tissue with scissors. Avoid taking blood vessels. Rinse pieces of tissue in Phosphate-buffered saline (PBS) pH 7.2 to remove blood. Transfer the tissue to 250 ml plastic bottles containing F12 medium (Dulbecco’s Modified Eagle’s Medium F12) without phenol red with 2% penicillin/streptomycin (including 5,000 unit/ml penicillin and 5,000 g/ml streptomycin) and 1% antibiotic/amphotericin B (including 10,000 units/ml penicillin, 10,000 µg/ml of streptomycin, and 25 µg/ml of amphotericin B). Store tissues in the medium for transport to the laboratory. Prepare pieces of 3 - 5 mm diameter for RNA and protein extraction and flash freeze them in cryovials with cold (dry ice) isopentane. Transfer them to dry ice box for transportation to the laboratory. Put pieces of 3 - 5 mm into mold and cover it with a layer of Optimal Cutting Temperature (OCT) and then place the mold on the flat bottom of box filled with cold isopentane. After complete freezing transfer the mold to the dry ice box. Fix 5 pieces of 3 - 5 mm diameter in paraformaldehyde (PFA) 4% and another 5 pieces in formaldehyde (FA) 4% in PBS at RT histological analysis later on. Two different fixatives are recommended as some antibodies work better with one or the other of the two. Document all information about the reduction mammoplasty, date of surgery and whether the samples are derived from left versus right breast. Place the frozen samples at -80° C and transfer the fixed tissues into histology cassettes after 2 hr of fixation. Then put them either in PBS or 70% ethanol, for O/N storage at 4 °C. On the next day, transfer the histology cassettes to histology facilities for paraffin embedding. Transfer the bottles containing the tissue samples to a laminar flow cabinet in a P2 cell culture room. Place tissue pieces on sterile chopping board (29 x 19 cm). Hold the material with forceps and scrape the remaining fat and vessels away from the breast parenchyma (white part) with scalpel . Place the white material in PBS in a 10 cm culture dish. After removing the fatty material from all pieces and disposing them according to the safety rules of the laboratory, place the white parts containing the epithelial tissues back on the chopping board. 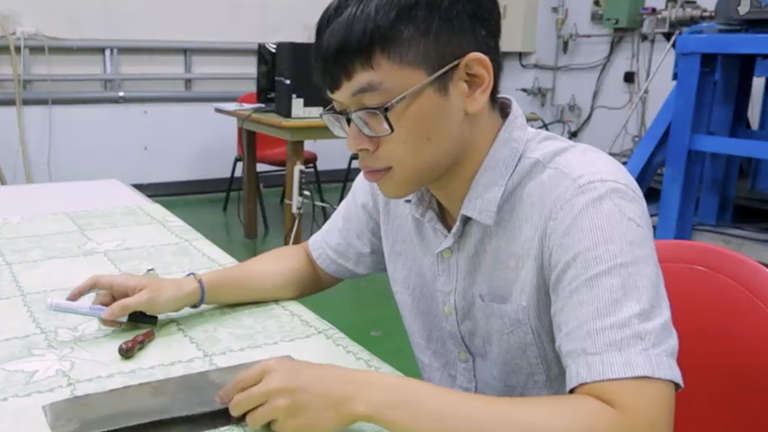 Using opposing scalpels cut the tissue and chop it to pieces of up to 2 mm diameter. Place the minced material into tubes of adequate size: up to 1, 2.5 and 10 ml into a 5, 15 or 50 ml tubes, respectively. Typically a 5 ml tube yields enough material for paraffin embedment and hormone stimulations, and a 15 ml tube yields enough material for Fluorescence Activated Cell Sorting (FACS). Larger tubes are used for freezing aliquots. Prepare digestion master mix consisting of medium (DMEM/F12 without phenol red) with 1% penicillin/streptomycin/amphotericin B and collagenase A (Clostridiopeptidase A from Clostridium histolyticum). Dose collagenase according to digestion times. For 12, 24, and 36 hr of incubation, use final concentration of collagenase of 1.5 mg/ml, 1.0 mg/ml and 0.5 mg/ml respectively. Add digestion master mix up to 4 times of the volume of the digested material to ensure adequate agitation and aeration. NOTE: Depending on the experimental design and the duration of hormone stimulation, add hormones either during or after the enzymatic digestion step and microstructure recovery. Add hormone(s) at desired concentration to test samples and the vehicle to the control. For stimulation with 17-β-estradiol, and promegestone (R5020) use a final concentration of 20 nM. NOTE: R5020 is a synthetic progesterone receptor agonist, which is more stable than natural progesterone in medium. Place tubes on the roller mixer inside an incubator at 37 °C and 40 rpm O/N. Before placing the samples on the mixer, resuspend them very well to ensure that all material distributes along the centrifuge tubes. As digestion takes at least 12 hr (O/N), for hormone stimulation times of less than 12 hr, add the hormones after recovery of the microstructures (detailed under step 3). Add the hormones as you resuspend the microstructures and place the suspension on ultra-low attachment plates. Tissue microstructures can be kept on ultra-low attachment plates for up to 7 days in growth-factor-free medium preserving about 70% viability. For RNA and protein analysis, collect tissue microstructures by centrifugation at 400 x g for 5 min and flash freeze in centrifuge tubes. Centrifuge the tube(s) at 400 x g for 5 min. Aspirate the fat from the top of the centrifuge tube and transfer the supernatant of the remaining aqueous supernatant, which is enriched in fibroblasts, to a new centrifuge tube and centrifuge at 1,250 x g for 5 min. NOTE: As the breast tissue microstructures are very sticky, for all subsequent steps resuspend the pellet by gently agitating the tube. Pipetting is not recommended due to the risk of losing material. Resuspend the pellets enriched in microstructures and in fibroblasts derived from aqueous supernatant in PBS, 2% Fetal Calf Serum (FCS). Subsequently spin both tubes at 1,250 x g for 5 min and then discard the supernatants. Resuspend the pellets in 3 - 5 ml red cell blood lysis buffer and transfer them to clean tubes. Incubate them for 5 min at RT. Add 2x volume of PBS, 2% FCS and centrifuge them at 1,250 x g for 5 min. Wash the pellets with PBS, 2% FCS and centrifuge at 1,250 x g for 5 min. Repeat this step twice. Add 1 - 2 ml trypsin 0.25% to the pellet and mix it by pipetting up and down very gently for 2 min with a 1,000 µl pipetman to dissociate cells. Inhibit trypsin activity by adding 9 ml PBS, 2% FCS. Centrifuge at 450 x g for 5 min and resuspend the pellet in 10 ml PBS, 2% FCS. Transfer the cell suspension onto a 40 µm cell strainer placed on top of a 50 ml centrifuge tube to prepare single cells. If a few microliters of cell suspension remain on top of the filter, help them pass through the filter by aspirating them from the other side of strainer with a pipet and add them to the filtered microstructures. Separate immune cells, fibroblasts and endothelial cells from microstructures with a cocktail of anti-CD45, anti-FAP and anti-CD31 antibodies and then sort them with FACS, based on pan-epithelial marker EpCAM and CD10 to separate luminal and basal cells respectively10. After washing the mechanically and enzymatically digested material as described above, fix pellets from 1.5 ml initial material in 1 ml of 4% PFA in PBS at RT for 30 min. Centrifuge at 1,250 x g for 5 min and wash with 1 - 2 ml PBS twice. Centrifuge at 16,000 x g for 10 min. During this time, prepare 1% multi-purpose agarose in Tris-Acetate-EDTA (TAE) buffer and heat the solution in the microwave oven until the solution comes to a boil. Remove the solution from the microwave oven and swirl the flask gently to mix the solution and resuspend any remaining agarose particles. Cool agarose solution to 50 °C and pour 1 ml in a paraffin base mold sized 31 × 23 × 13.5 mm. Discard the supernatant and place the pellets on top of the solidified layer (1 - 3 mm) of agarose using a spatula with a flat end. Cover them all with an additional layer of agarose (40 °C). After the agarose solidifies, usually within 5 min, put the agarose blocks into the histology cassettes for paraffin embedment. Along with the agarose samples place a white office paper in the cassette with all information about the reduction mammoplasty number, experimental condition, and date written in small letters in pencil; this writing withstands all subsequent treatment steps. Put the cassettes in PBS O/N, or in 70% ethanol for storage over the weekend, at 4 °C. We have not noticed any difference between the two storage solutions. Then transfer histology cassettes to histology facilities for paraffin embedding. Resuspend tissue microstructures in freezing medium consisting of FCS with 10% dimethyl sulfoxide (DMSO) and freeze 1 ml aliquots in cryovials. The number of obtained cryovials depends on the amount of primary material obtained from reduction mammoplasty. Freeze the cryovials containing tissue microstructures using a controlled rate freezer with the following program: 5 min dwelling at 4 °C, decreasing the temperature to -7 °C with rate of 6 °C/min, decreasing the temperature to -12 °C with rate of 6 °C/min, 10 min dwelling, decreasing the temperature to -40 °C with rate of 6 °C/min, decreasing in temperature to -80 °C with rate of 6 °C/min. Then transfer the cryovials to -80°C freezer. Next day, transfer the cryovials from -80°C to liquid nitrogen tank for long storage. To study the role of estrogens and progesterone and to better understand their molecular functions in the human breast, we collect fresh human breast tissue specimens from patients undergoing reduction mammoplasties (Figure 1) after obtaining their informed consent. We also obtain the patients’ medical and reproductive history, as well as a blood sample to determine serum progesterone levels at the time of surgery. Tissue from fresh reduction mammoplasties is mechanically and enzymatically dissociated. The resulting tissue microstructures have ducts and lobules characteristic of the breast tissue of origin (Figure 2A). Immunohistochemical analysis of agarose and paraffin-embedded tissue microstructures stained for the myoepithelial marker ΔNp63 (Figure 2B) reveal that microstructures retain not only the morphological characteristics of the normal breast tissue but also the molecular profile of the cell populations. To assess the hormone response, tissue microstructures were treated either with the synthetic progesterone receptor agonist promegestone (R5020) or ethanol control. To enrich for the hormone receptor positive luminal cells flow cytometry was performed based on epithelial (EpCAM) and myoepithelial marker (CALLA; Figure 3A) after depletion for endothelial, fibroblasts and immune cells with a cocktail of anti CD31, anti-FAP and anti-CD45 antibodies. qRT-PCR analysis of EpCAM+, CD10- cells showed up regulation of the progesterone target gene Wnt-4 (Figure 3B) in the luminal cell enriched population from the R5020 exposed tissue microstructures. Figure 1. Breast tissue specimen. Photograph of freshly dissected reduction mammoplasty sample. Arrows point to white tissue strands that contain the breast parenchyma, i.e., milk ducts and terminal ductal lobular units. Embedded within abundant yellow adipose tissue. 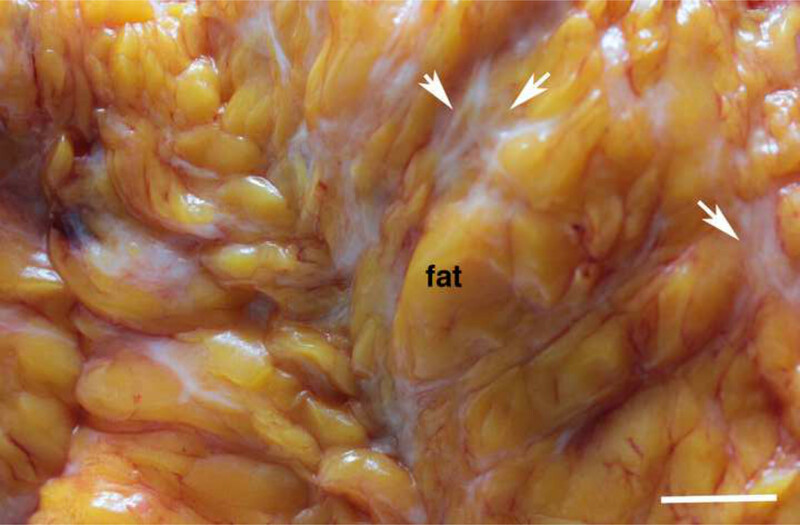 While the color of the fat does is consistent between patients, the proportion of adipose tissue, generally the largest part of the breast tissue in terms of volume, varies. Scale bar: 5 mm. Please click here to view a larger version of this figure. Figure 2. Tissue microstructures. (A) Bright field image of microstructures cultured on a low attachment plate for 48 hr after mechanical dissociation and enzymatic digestion. Scale bar: 40 μm. (B) Micrograph of a histological section on tissue microstructures embedded in agarose and paraffin after 3 days in culture. The section was subjected to immunohistochemical staining for the myoepithelial marker ΔNp63 and counterstained with hematoxylin. Arrowheads point to the inner, luminal cells, arrows point to ΔNp63 positive myoepithelial cells. Scale bar: 40 μm. Please click here to view a larger version of this figure. Figure 3. Flow cytometry sorting separation and RNA analysis of tissue microstructures. (A) Separation of the different cell populations from tissue microstructure treated with R5020 or ethanol by flow cytometry. Tissue microstructures were dissociated and immunodepleted for immune cells, fibroblasts, and endothelial cells with a cocktail of anti-CD45, anti-FAP, and anti-CD31 antibodies. Cells were labelled with antibodies against Epithelial Cell Adhesion Molecule (EpCAM) (clone HEA-125) to enrich for the luminal cell population (green) and Common Acute Lymphoblastic Leukemia Antigen (CD10/CALLA) for myoepithelial cells (Clone SS2/36). A representative scatter blot is shown. (B) Bar graph showing relative Wnt-4 mRNA expression levels in the luminal subpopulation from tissue microstructures (green dot cloud, panel A) induced with ethanol or R5050 for 24 hr. Relative mRNA expression levels of the progesterone target gene, Wnt-4 normalized against mRNA levels of hypoxanthine-guanine phosphoribosyltransferase (HPRT). Data shown represent the mean ± SD of triplicates. RNA isolation and qRT-PCR were performed as described previously14. Primer sequences: Wnt-4: forward 5′- GTGGCCTTCTCACAGTCGTT-3′ and reverse 5′- ACCTCACAGGAGCCTGACAC-3′, HPRT: forward 5′-GACCAGTCAACAGGGGACAT-3′ and reverse 5′- CCTGACCAAGGAAAGCAAAG-3′. Please click here to view a larger version of this figure. The ex vivo culture described here provides breast tissue microstructures containing intact ducts and lobules, along with other cell types normally found in the human female breast. In the processing of the human breast tissue usually obtained from reduction mammoplasties, removal of adipose tissue, mechanical and enzymatic digestion of the stromal matrix, and lysis of red blood cells enriches for milk duct fragments and terminal ductal lobular units. Gentle enzymatic digestion at the right concentration, for the right duration is essential to ensure that tissue microstructures remain intact, retain multiple cell types and largely preserve their extracellular matrices. Attention should also be paid to processing the tissue quickly once removed from the patient. Patient samples vary substantially and mechanical and enzymatic digestion may need to be prolonged, and/or extra enzyme needs to be added when tissue is particularly high in collagen content. Although microstructures remain 90% viable for up to 6 days, the model has the limitations for long-term hormone stimulations. As different cell types have different half-lives, the cellular composition is likely to change over time. While the tissue microstructures preserve infiltrating immune cells, these are not replenished as the tissue is removed from the body’s circulation. Furthermore, a solid pipeline with the clinical partners who provide the surgical specimens is required as large numbers of samples need to be analyzed because of inter patient variation. Tissue microstructures can be frozen for later use. However, to what extent freezing and thawing affect cell viability, possibly differentially for different cell types, and how this may alter hormone response, has not been characterized. Planning of experiments can be difficult as for any mammoplasty the amount of tissue microstructures that will be obtained is hard to anticipate. To our knowledge, the present ex vivo model presents the first model to study physiologic hormone action in the human breast. While sophisticated 3D culture systems for primary breast epithelial cells have been developed, this ex vivo system preserves the tissue architecture and its cellular complexity over several days. As a result, not only the response in the hormone receptor positive target cells can be analyzed but the events downstream of paracrine signaling in other cell types become amenable to study. The microstructures are kept in growth factor-free medium throughout the duration of the experiments. Hence, there is no confounding extrinsic activation of signaling cascades. As such, the breast tissue microstructures offer the possibility to address questions in a setting that reflects more closely the biological complexities of the human breast. The ex vivo system can be used to assess the response of the breast to natural and synthetic hormones. This is very important in light of an increasing incidence of breast cancer. Furthermore, drugs, small molecules, peptides, growth factors, and cytokines can be applied and their effects on cell proliferation, apoptosis and signaling be studied. The present detailed description is meant to facilitate the use of this method by other investigators and to help minimize inter laboratory variation. As this approach relies on patient samples, it is of utmost importance that a standardized method is used so that results can begin to be compared between different laboratories15 and a better appreciation of inter patient variability becomes possible. The authors appreciate feedback and will be happy to integrate improvements into revised versions of this protocol. The work with human samples is very challenging and the authors hope to stimulate more translational research with interesting biological samples. The authors thank M. Fiche of University Hospital of Lausanne for providing the mammoplasty photograph, M. Wirth and A. Ayyanan of Swiss Institute for Experimental Cancer Research, National Center of Competence in Research Molecular Oncology, School of Life Sciences, Ecole Polytechnique Fédérale de Lausanne for technical assistance and R. Clarke of University of Manchester for critical comments. The research leading to these results has received support from SNF3100A0-112090, Oncosuisse 531817, and the Innovative Medicines Initiative Joint Undertaking under grant agreement no. 115188, resources of which are composed of financial contribution from the European Union's Seventh Framework Program (FP7/2007-2013) and European Federation of Pharmaceutical Industries and Associations companies' in kind contribution. The Web address of Innovative Medicines Initiative is http://www.imi.europa.eu/. Beral, V. Breast cancer and hormone-replacement therapy in the Million Women Study. Lancet. 362, (9382), 419-427 (2003). MacMahon, B., et al. Age at first birth and breast cancer risk. Bull World Health Organ. 43, (2), 209-221 (1970). Pike, M. C., Krailo, M. D., Henderson, B. E., Casagrande, J. T., Hoel, D. G. 'Hormonal' risk factors, 'breast tissue age' and the age-incidence of breast cancer. Nature. 303, (5920), 767-770 (1983). Brisken, C., O'Malley, B. Hormone action in the mammary gland. Cold Spring Harb Perspect Biol. 2, (12), a003178 (2011). Levenson, A. S., Jordan, V. C. MCF-7: the first hormone-responsive breast cancer cell line. Cancer Res. 57, (15), 3071-3078 (1997). Tanos, T., Rojo, L. J., Echeverria, P., Brisken, C. ER and PR signaling nodes during mammary gland development. Breast Cancer Res. 14, (4), 210 (2012). Roskelley, C., Desprez, P., Bissell, M. Extracellular matrix-dependent tissue-specific gene expression in mammary epithelial cells requires both physical and biochemical signal transduction. Proc Natl Acad Sci U S A. 91, (26), 12378-12382 (1994). Kass, L., Erler, J. T., Dembo, M., Weaver, V. M. Mammary epithelial cell: influence of extracellular matrix composition and organization during development and tumorigenesis. Int J Biochem Cell Biol. 39, (11), 1987-1994 (2007). Graham, J. D., et al. DNA replication licensing and progenitor numbers are increased by progesterone in normal human breast. Endocrinology. 150, (7), 3318-3326 (2009). Wang, J., et al. Comment on "Progesterone/RANKL is a major regulatory axis in the human breast". Sci Transl Med. 5, (215), 215le214 (2013). Brisken, C. Progesterone signalling in breast cancer: a neglected hormone coming into the limelight. Nat Rev Cancer. 13, (6), 385-396 (2013). Xu, R., Boudreau, A., Bissell, M. J. Tissue architecture and function: dynamic reciprocity via extra- and intra-cellular matrices. Cancer Metastasis Rev. 28, (1-2), 167-176 (2009). Tanos, T., et al. Progesterone/RANKL is a major regulatory axis in the human breast. Sci Transl Med. 5, (182), 182ra155 (2013). Yalcin-Ozuysal, O., et al. Antagonistic roles of Notch and p63 in controlling mammary epithelial cell fate. Cell Death Differ. 17, (10), 1600-1610 (2010). Hines, W. C., Su, Y., Kuhn, I., Polyak, K., Bissell, M. J. Sorting out the FACS: a devil in the details. Cell Rep. 6, (5), 779-781 (2014). Posted by JoVE Editors on 02/01/2015. Citeable Link.